They’re actually my parents business – my mum and dad run it. It’s an IT recruitment agency and it’s just the two of them and their two main competitors have dozens of staff, and the competitors even have their own internal marketing staff. So they do pretty well, all things considered. I’ve been helping with SEO over the years. We used to do a lot on the guest blogging front. And the great thing about the recruitment sector is there’s absolutely tons of content opportunities out there. Things like: what you write on your CV? What do you write on your cover letter? What do you say in your job interview? What do you wear to your job interview? Etc. etc. And while that’s all well and good, it’s all been done-to-death and a lot of people have… you type in “how to write a good cover letter” and there’s probably about a thousand different articles telling you how. So it’s all been done a lot before. 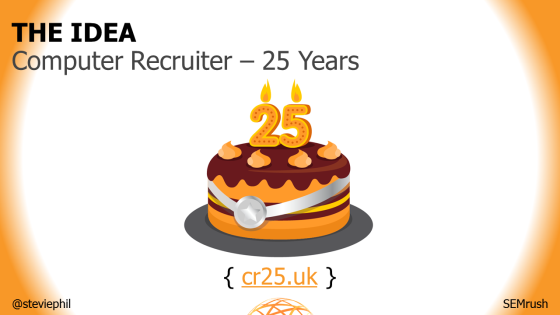 I came up with the idea of CR 25 to celebrate their 25th anniversary. They launched in January 1990, so January 2015 marked the 25th anniversary. And I had the idea of a dedicated, separate blog on a separate domain with 25 blog posts. When it came to deciding what content we wanted, obviously two of the three types of content we wanted were related to their industry. 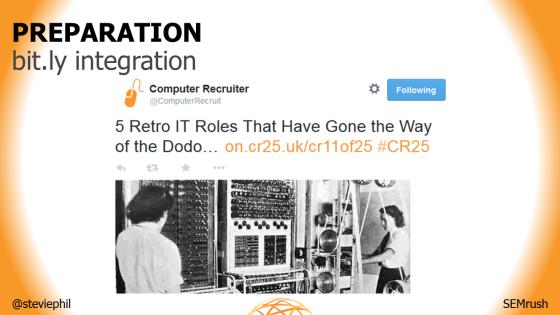 So IT, including computing, digital – they also recruit from some SEO roles. And recruitment, jobseeking, CV writing – all that kind of thing. The third piece of the puzzle, that was important to us, was we wanted everything related to South Wales, our area in the UK. So we wanted everything local-focused, and we wanted everything regional-focused. I could have put the word out on Twitter saying: “does anyone want to write this?” I know quite a few SEOs and content marketers – that would have been easy. But I wanted a lot of the focus and a lot of the people we asked to contribute to be based in the area, and we wanted content about the area as well. And I’ll show you some examples of what I mean later on. 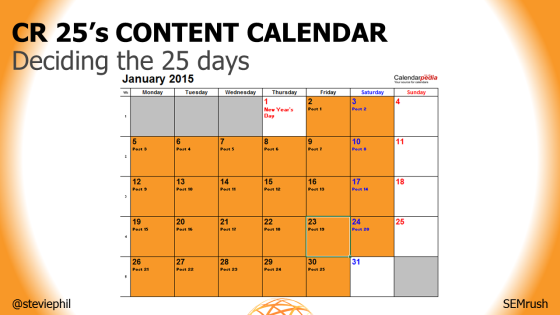 When it came to choosing the 25 days, we decided every day except for Sundays, starting on 2nd January and ending on the 30th. The good thing about a campaign like this is I was able to work around my schedule. I actually take part-time paternity on Wednesdays, so I made sure that Wednesdays were posts that didn’t demand too much outreach – things like that. And on Saturdays, I mean Saturdays aren’t really big days – at least in my experience and Computer Recruiter’s experience – in sharing posts. We didn’t want to publish anything too important on a Saturday. That sounds a bit cruel – and I usually reserved it for posts that were written by me – because we thought if we had a big, important guest blog post, and there’s less of a readership on a Saturday, that wouldn’t be very fair. 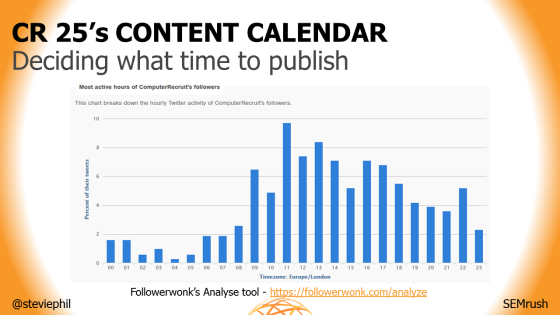 And in terms of deciding what time to publish every day, we actually used Followerwonk – the tool by Moz – to help us decide. This is a screenshot from the other day that shows that 11am (between 11am and 12pm) is the best time to publish, UK time. At the time, six months ago, it was saying the best time to publish was 10am in the morning, so we published every post at 10am on the dot. I wanted it to be consistent so that people knew: “I’ve got to login or go on the website and see what the new post is today.” And I actually know of a few people who – as the campaign went on – would actually check every day after 10am what that day’s post was. So that was great. And we started planning six months early, which might seem a bit extreme, but I’m very glad that we did because in the end we only managed to get 20 of the 25 posts ready by the end of December, ready for launch. So I was rushing around in early January trying to get 5 more posts done. And if I hadn’t have been so strict or hadn’t prepared so early, I might not have hit target – and we might not have even had 25 posts ready for this campaign. And when we approached people to contribute and to write guest blog posts, as I said two minutes ago, I could have just tweeted or put the word out on somewhere like MyBlogGuest. But instead, I selectively recruited and chose guest bloggers. A few ways we went about it were by asking past and present clients and candidates of Computer Recruiter, to help strengthen the relationship. And really importantly, we targeted people we wanted as clients and candidates – I’ve got a fantastic example of where this really paid off later on. 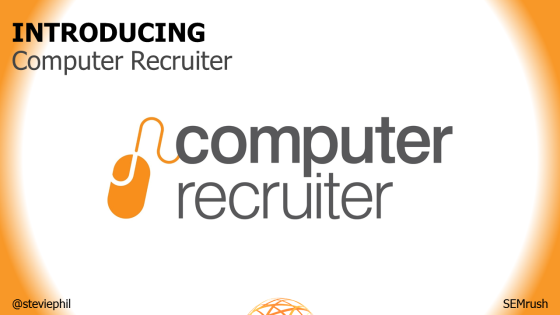 So they were people who weren’t familiar with the business – with Computer Recruiter – but we got in touch saying: “hey, would you like to contribute one of the 25 posts for us, or contribute to part of the post?” And it was a really good way to get onto their radar. And as mentioned earlier, local was the focus. Local, local, local. We wanted people who were experts in IT and in recruitment. One great example: we had a guy who is the face of the startup community in the region and we managed to get him involved as well. So the focus on local was really important. This example here is the 11th post that went live. For the full URL, we’d include “cr”, the number of the post, and then the title. 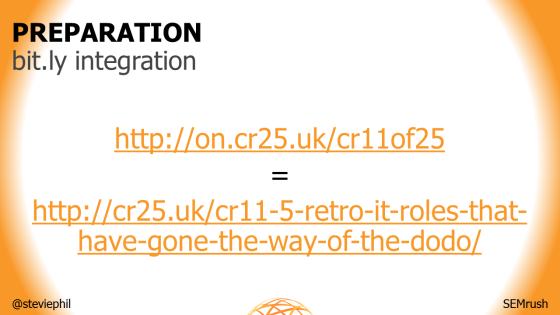 And then through bit.ly, we also did – so in this example – it was “cr11of25”. And we did this for all 25 posts. That’s an example of that post in particular being tweeted. I think it was just a really nice touch and it helped to reinforce the brand just a little bit more. …which was great because we actually sent out some teaser tweets and teaser status updates, letting people know when the website would be going live. And at this point, we didn’t really tell people what it was all about, so it was just getting them all curious and getting them wondering what was going to be happening in January. 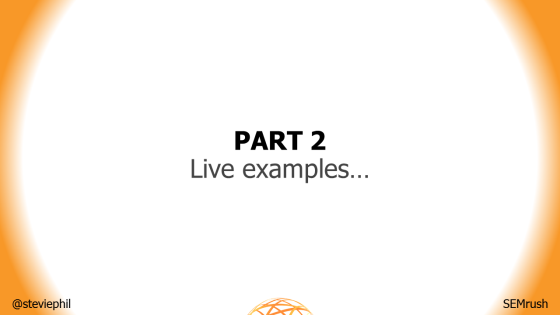 Ok, so now I’m going to jump out of PowerPoint and I’m going to show you some live examples. So I’ll just run through everything really quickly, and I’ll go through all 25 posts, but some of them will only need a few seconds each because some of them are sort of grouped together: we did a series, so I’ll explain to you the first one, but I won’t need to explain all of them. And what I’ll also do as well is I’ll try to keep scrolling to a minimum, because otherwise I’m worried that you guys will all get motion sickness! So I’ll try and scroll to the best of my ability without scrolling too much and making you all feel sick. 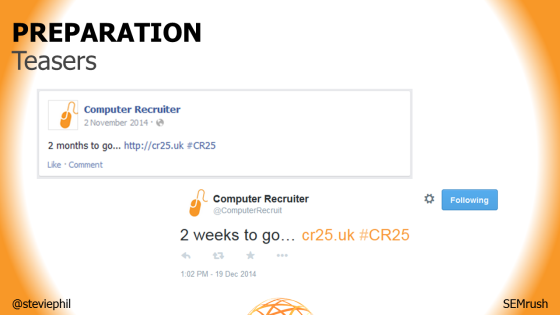 Post 1 of 25: Introducing CR 25! So the first post that went live: we just introduced the campaign, let people know what was going on, the veil was lifted, the ‘coming soon’ page was gone, and this is what people now saw. And it just gave a few examples of what kinds of posts were coming up, who was going to be contributing some of the posts, and a bit of the background about what was going on. 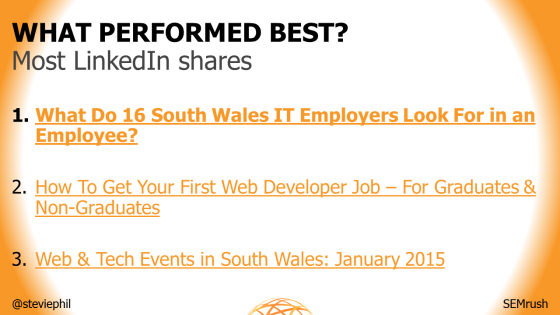 The first main post we did was a list of Web and tech events in South Wales in January. So I did something like this before on my own blog as a one-off and it worked really well – it was a really popular post, so I thought that I’d replicate it for this campaign. It’s no longer on the page, but we used to have a Google Calendar embed: I created a custom Google Calendar and it was embedded here, so you could see it all in a calendar format as well as in a long list. And people could actually add the events straight from our calendar to their own calendar, which I thought was quite useful and handy to people. And as you can see, all of the events listed – one below the other – so there were design events, web design/development events, and I think it was like a cyber security event… all sorts really. The great thing here was on the outreach front, when we published the post, we tweeted all of the event organisers letting them know that it was live and a few of them shared it. And I actually added more and more events as-and-when I found them and as-and-when more got announced, so there might have been an event that was a bit towards the end of January that was only announced mid-January, so I quickly added that in. So I was able to keep updating it and adding to it, and that also gave a great excuse to tweet it again – and I could say: “we’ve just added this to our list of events,” which is great, so it got a lot of love and a lot of attention on Twitter. And the third post – I was really proud of this post. It’s an interactive timeline of 25 years’-worth of notable, historical moments in IT. So, I’ll give you an example: when Windows 3.1 was released, when Amazon was founded in 1994, and so on. I had the idea for the post and originally I was just going to do a list of bullet-points and it seemed like a waste. So I did some research and I found that there’s this plugin – I think it’s called Knight [Lab] TimelineJS – free to use, and you just put in all the data in a Google Docs spreadsheet online and it feeds into this plugin. So it took a lot of setup, but it looks absolutely fantastic. As you can see, it goes on – I tried to have two or three every year if I could manage it. The problem was that this post actually flopped. I was really gutted. I do honestly think that the reason this flopped was just the timing. I wanted to publish some posts – some really strong content – really early on, because this was the beginning of the first full week and I wanted to go to the press and say: “this is what we’re doing,” and I didn’t want the first few posts to be some weak posts and then publish all the good stuff later on. But this was actually Monday 5th January, so this would have been… if people took two weeks off over Christmas, this probably would’ve been the first day back in the office, probably catching up on emails, and the last thing they’re probably going to be doing at 10am is checking Twitter, which is obviously – as I said – we published the posts at 10am. So I do think this was just an issue of timing, which is a real shame because I do think that this would’ve been very nostalgic for a lot of people, and some of them were quite surprising like what date certain things launched and when things happened. Post 4 of 25: Why Cardiff? Ironically, one of our most successful posts was one of our easiest to sort out and one of our shortest. This was a guest blog post by a friend of mine called Neil – he’s sort of the face of the startup/entrepreneurship community in South Wales. And he said: why start a business in Cardiff? Why not London, the capital of the UK? Why Cardiff? And he talked about some reasons why Cardiff’s sort of the underdog and why it’s important as well as obviously starting a business, you can start a tech business and hire IT staff, which ties into what we were about. And as you can see it’s a very short post, it’s only about 300 words, but somebody shared it on Reddit – on the Wales subreddit – and it got shared on a few other places as well. Neil is very well-known – he tweeted about it, and it really picked up some momentum. So it’s quite funny how one of the longest posts – one of the most difficult to put together – flopped, and one of the easiest to put together did really well. And I guess it goes to show you that you never know what’s going to happen. You can only speculate what’s going to do well content-wise, and it’s only when you publish it that you see what happens. What’s interesting about this post as well is it gave me the chance to wear my community manager hat… if I scroll down here, we actually had a very negative comment from somebody, who took offense because Neil said our population’s young, creative and educated and this gentleman here – I think he was in his 50s or 60s – he had a big moan about it. I asked Neil if he didn’t mind getting involved, and Neil luckily diffused the situation really well. And that’s really important because I didn’t feel like it was my place to respond because I didn’t write the post, but if Neil hadn’t responded, or if he had responded negatively, it still would have blown-back onto the brand – onto Computer Recruiter – for the fact that we posted it. But luckily for me, Neil was able to sort it out. So it just goes to show that if a post gets taken offline, it’s a difficult call to say: should you post it somewhere else, like, if a guest blog post gets taken offline, should you ask someone else to publish it – because they might be uncomfortable, because it’s already been published somewhere else before – so it seemed like the ideal place to publish it here instead, because I didn’t mind – I would rather it be published here, a second time, than for it to go to waste. So that’s a good thing to remember: if you’re still doing guest blogging these days, keep an eye on where they’re getting published, and if you do get removed for whatever reason, you can always consider republishing them on your own website. This was a post by one of Computer Recruiter’s clients and candidates. He’s been in IT since the 80s, so we asked him to talk about what’s changed in 25 years. Really interesting post. He talks about how – obviously – if people had messages, they used to be faxed, and I think there’s a picture down here of a computer that he was involved with initially – I think that’s about five feet tall? Crazy compared to the size of computers these days and what our mobile phones can handle as well. So this was good for reinforcing the brand – the fact that we were talking about 25 years of IT – and reinforcing the campaign. And it was great to get David on-board because – as I say – he’s a client and he loved the idea of being approached and he was really chuffed about contributing as well. We did an interview with a social media consultant. The typical sort of thing: what should you or shouldn’t you do on social media. The great thing about Miranda in particular is she’s actually won work through her use of LinkedIn. She actually got a job because of the way she used LinkedIn, so she doesn’t just talk the talk, she walks the walk – she knows from first-hand experience. She gives advice for what you should and shouldn’t do on social media, so it was great to have her name on-board as well because she’s well-known in the area as well. Post 8 of 25: Text? Video? Infographic?! What Type of CV Should You Use? This was another post of mine. This was actually a guest blog post that I was struggling to get published. I like to think it was because it was an opinion piece – and quite opinionated at that. Hopefully it wasn’t because it was not very good…! But another thing you can do is if you are really struggling to get a guest blog post published somewhere, as a last resort you can consider publishing it on your own blog, or for a big campaign such as this. So that’s that. I did a list of co-working spaces in South Wales. This is the 9th post. I’m working from home today and the webinar is taking place from home today, but I’m mostly based in a co-working space. I had the idea of doing a custom Google Map showing where all the spaces are, and they’re colour co-ordinated depending on the branding of the space. So we have sort of three main spaces in South Wales, one of which has multiple locations, as you can see here: the blue pins. I’m based where the green pin is. That’s Cardiff there. And I liked the idea of doing that: instead of just – as you can see below – we also did a list of all of them in alphabetical order and included information such as: do they open late, do they open on Saturdays, can you book a meeting room there… But I liked the idea of having the map so people could just really quickly and easily see: “right, I’m based here – what’s near me?” And the good thing about this post as well is it actually ranks in Google for “co-working cardiff” and for “co-working south wales”. So even now – six months after the campaign went live and this post went live – it’s still getting found in Google by people. I had an idea for a couple of posts called “A Look Inside…”, which was to ask companies to talk about their IT processes, their development cycles, what software and tools they used. Nudjed here were very open. They actually gave me access to Trello and Slack, and let me take a few screenshots, which was amazingly transparent of them. I think there’s a photo here of – they’ve taken and put everything online now – but they’ve got a wall of post-it notes to keep track of where they are with everything. It helped promote this company, this startup in South Wales. It also helped people to – say if as a graduate, who’s just come out of university, who wants to work for a company – he or she can see what it’s like to work at a startup, at a very small business, and it gives them insight into that. And Nudjed as well are quite popular on Twitter and they were happy to share it and promote it as well, so obviously… for a lot of this, when we had guest bloggers involved or people contributing, a lot of them shared it, so it wasn’t just us promoting it as well – it was getting them to help promote it, which was great. This was the first post that we had done by a copywriter. I actually got four posts done by a copywriter to use as back-ups, just in case people let us down. We had quite a few people promise and guarantee that they would create content for us, and – surprise, surprise – people let us down, because people are busy, people love to say “yes” and they don’t fulfil what they say they’ll do. So out of the four posts I asked to get written as back-ups, we actually needed to use three of them in the end. 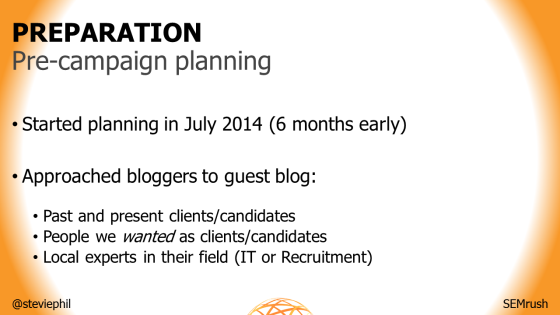 So if you are doing this kind of campaign, I recommend getting some posts done as back-ups, just in case. And if you do, I recommend getting evergreen posts – posts that’ll still be relevant weeks, months, maybe even years later – the reason being that our plan was if we didn’t use these posts for this campaign, we were going to use them as guest blog posts in the future instead. And if Holly – who wrote the posts for us – wrote topical posts that were only relevant to January – say if it was a news story – it might have gone to waste entirely. So that’s important if you’re doing that kind of thing, something to take on-board. Another “Back in the Day” post… this time I asked my parents to say: what was it like running an IT recruitment agency in the 90s? And it’s actually a really insightful post. They talk about how it’s in the days before job boards, so they had to advertise in print and they’d have to fax over their copy, and if they missed their deadline, they’d have to wait another week so it could take up to nine days for their job ad to appear in a publication – and they’d be absolutely screwed if there was a spelling mistake! Talking about fax machines and what would happen if they broke down. And it was in the days before mobile devices were popular, so they used to have to carry around pockets full of change just in case they had to use the phonebox. So really interesting, insightful stuff that – again – reinforces the message that they’re long established, they’ve been in business for a very long time. This was another, well, sort of a guest blog contribution. Aimee here is a video blogger who gives a lot of advice to jobseekers. And what’s great here is that I actually asked Aimee if she could get involved, and she said: “thank you, but I actually charge for guest blog posts.” And rightly so: she’s written for the Daily Mail, I believe the Guardian, the Independent – some big publications in the UK, and as well as in the newspapers, they appeared on their websites, so she said she charged £200 for a post. And I said: “Aimee, I’m really sorry – we don’t have that kind of budget, but I have this idea instead: could you hand pick your top five videos?” And she said “yes” – and she was happy to do that for free. So it’s a little bit cheeky… We really still wanted Aimee on-board, she’s very well-known and very popular. Her advice is brilliant – especially for those who are looking for a new job. So we still had her name on-board but we managed to side-step the issue around payment. 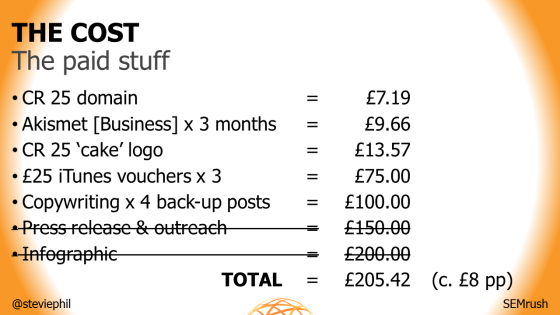 So that’s a suggestion if you’re in a situation where you’d love to get a guest blogger involved, but they’ve said: “I charge this much money,” but you haven’t got a budget for it, you might be able to work something out. And with Aimee, both her personal Twitter and her business Twitter are very, very popular with lots of followers – and she shared them as well, which was great. This is a post I published on Daily SEO Tip a couple of years ago, and one day the website just went offline. I tried to get in touch with the people who ran it, find out what was going on, but no luck – and I believe it’s still not live to this day. And again, similar to the Squidoo post I mentioned earlier, it was a post I wrote that I was really proud of and it seemed a shame to let it go. So I republished it on here. 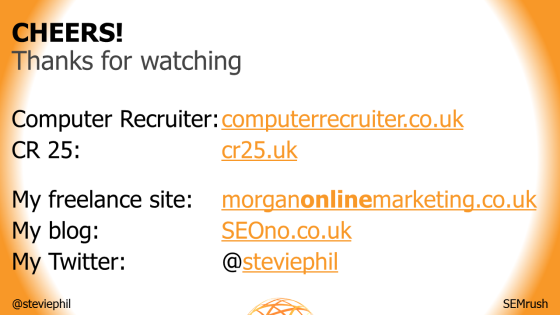 It just gives advice to people who are recruiting for SEO roles, especially if they’re not a dedicated SEO agency – e.g. if they’re a marketing or web design agency and they’re just recruiting for an SEO person for the first time – giving suggestions on what they should do, based on my own personal experiences as a jobseeker for SEO and also actually in one of my jobs I actually helped to recruit for SEO roles as well. This was a great post, it was a personal story. Cheralyn here is a web developer for a web design agency just outside Cardiff. She doesn’t have any formal qualifications – she didn’t go to university – and people said to her: “you don’t stand a chance.” And they also implied that she might not stand a chance because she’s a woman as well, so there was a sexist angle as well. And I was so glad we published this because she is – excuse my language – she’s kicking arse now! And really, she’s doing well career-wise, and she’s shown-up the people that told her she wouldn’t succeed, she’s obviously shown them that she can. So she wrote about her experiences getting into the web design/web development industry and talked about giving advice on what others can do in a similar situation. She actually created a few free websites for some of her friends to build her portfolio, for example. And I’ll talk more about this later, but this worked really well on Facebook, because she shared it on Facebook and a lot of her friends/colleagues shared it as well and Liked it as well. I think it was the most popular post in terms of driving traffic through Facebook. It was just great to share her story as well. Post 16 of 25: What Do 16 South Wales IT Employers Look For in an Employee? We did a couple of crowdsourced posts. In the SEO industry, we’re all familiar with the posts that say: what are SEOs’ favourite link building tips, what are SEOs’ favorite SEO software programs – with large lists of people like Rand Fishkin and Neil Patel thrown in and they get involved and they’re asked for their contribution. And I think where people are missing a trick is when in SEO, we ask our peers – who could be our competitors – to write guest blog posts for us, to contribute to these kinds of posts. If Computer Recruiter were to do the same thing, they’d be asking their competitors – other recruiters to contribute to these kinds of posts. Instead, what we did, we asked employers who were potential clients: what do you look for in an employee? And as you can see here, I’ll just scroll through a few… We had quite a few people get involved and say what they look for in an employee. The great thing as well is, as well as current and past clients, we got in touch with potential future clients. We got in touch with one person and he said: “thanks for getting in touch, I’d love to, I’m going to contribute – by the way, I’m looking for a developer now, can you help?” And he actually came on-board as a client. Now this was back in October when we emailed him and asked him to get involved, and this website didn’t go live until January. 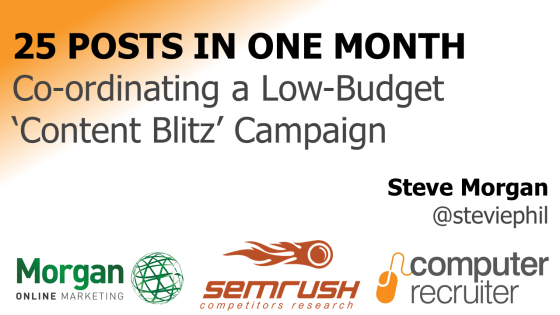 So three months before launching the campaign, the campaign proved ROI, which is fantastic. And it feels like I had some sort of time machine, or needed a time machine…! But it just goes to show that just asking people to get involved in your content is a great way to get onto their radar. As well as a lot of small/medium-sized businesses in South Wales, we also got some big UK household names on-board. We had contributions from Confused.com, Legal & General and – in the other crowdsourced post, which I’ll get to in a minute – we had a contribution from the BBC (BBC Wales). So, some really big names, which we were really chuffed about. And another thing I did as well is – forgive the scrolling – I went to the effort of summarising what people said, and I’m really glad I did this because it was really insightful. You assume that the most important thing for employers when you’re hiring someone is technical fit – they want to make sure they’ve got someone who can do the job. But actually more people said that they were after someone with a good attitude than they were with the right technical skills. So people argued that they’d rather have someone who was enthusiastic and passionate, who might need a little bit of training, than someone who already had the skills but might be a bit cocky and a bit arrogant. So it was really useful to summarise that, and we had some good feedback from people saying: “I really liked the summary, that was a good idea.” So if you are doing a crowdsourced kind of post, then I recommend summarising the responses as well. And honestly, outside of our industry – the SEO industry/the content marketing industry – I rarely ever see posts of this nature where a lot of people are asked to contribute just a paragraph or two or a few lines. So I think there’s a missed opportunity there and crowdsourced content can really become popular in other areas in the future. A big, serious issue at the moment is that there’s a big demand for IT and digital roles, but low supply. And what a couple of initiatives are trying to do is to try and incorporate IT – or as they sometimes call it “ICT” in the education sector – and try to get it introduced at primary school level, so that children… the problem is that when they get to their teenage years, IT is seen as geeky, it’s seen as nerdy, but obviously – and we all know – digital stuff’s cool, isn’t it? So they try to introduce it at the primary school level, so when children get to secondary school level, they’re more used to it and it’s more approachable to them. So we interviewed some initiatives that do this kind of thing, so Technocamps – to give you an example – puts on clubs/workshops, where – in this example – they teach children how to create their own robots that can play football. It’s absolutely amazing. And to try and hopefully get them interested in things like computer science, into coding, into web development, maybe even SEO when they’re a little bit older. And this was one of our longest posts because we had three lots of interviews, as you can see here, I’ll just scroll… Oh, we also had a Vine embed here – which I thought was a nice touch – of a robot in a primary school. So we made use of things like Twitter embeds as well, YouTube embeds… And this was about 3,000 words and I think this performs quite well in driving traffic from organic search, probably just because of the long-tail, because it’s such a long post. I’ll start hurrying through the last few examples because I think I’m running out of time. Another “A Look Inside…” example, so another company based in South Wales talking about their processes. An interview with someone who runs a couple of conferences and quite a few events every year about web design – he very kindly let me speak about SEO at one of them – because he was one of the first to host web design events, it was great to have him on-board talking about how things are now compared to five years ago. Post 20 of 25: Out of Office: Why Are IT Professionals Leaving the Office to Work From Home? Another copywritten post that was provided to us by a copywriter. Another “Back in the Day” post. This gentleman shared photos of himself in 1979, 1990, and modern day as well, which I thought was a very nice touch. 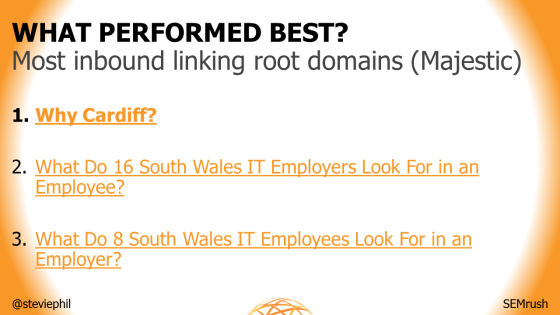 Post 22 of 25: What Do 8 South Wales IT Employees Look For in an Employer? As they say, another crowdsourced post. This time we asked employees what they look for in an employer and as well as encouraging them to… I said: “I would link to your employer, but we’ll also link to any sort of freelance/portfolio website or blog that you have as well.” So again, responses here. And again I summarised this one – sorry to scroll so quickly – and salary was only mentioned by one out of eight of the people. The most important thing to employees is to have their ideas listened to. So I felt that this was important for employers to know, so I felt like we were really – with content like this – it was really useful to our target audience, our target market to read this kind of thing. Getting towards the end of the campaign now in late January. This was another post written by a copywriter. We did a ‘dissected’ infographic for our last-but-one post. What I did here was… We all know the problem with infographics is that search engines can’t read images for text, except for things like the alt-text or the file name. So I had the idea of having a very linear infographic, in a very sort of top-to-bottom layout, and then chop it up into sections and then include text around each of the sections – as you can see here – talking about each section individually. And this was comparing 25 CVs from 1990 to 25 last year and seeing what the differences were: what kinds of skills, what kinds of industries, what was the male/female divide like? 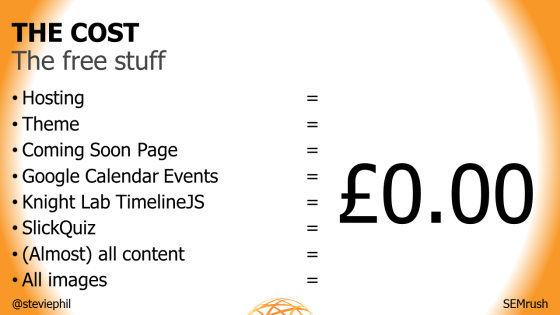 And as you can see, towards the end, we still published the infographic in full with the classic embed code as well. But what I liked about this is that it wasn’t just ‘infographic, publish, job done’. It’s got about 1,000 words of text with it as well. So it’s hopefully hit the long-tail a little bit as well. And we ended things off with a quiz. 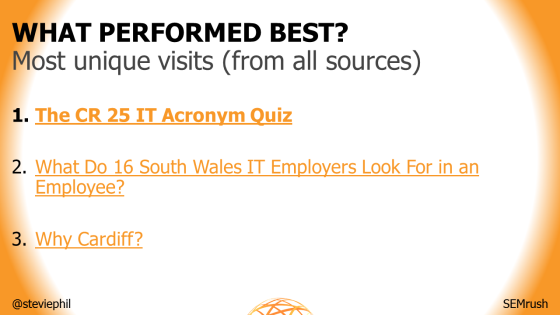 This was using a plugin called SlickQuiz, a free to use, multiple choice quiz – what do certain IT acronyms stand for? As you can see there. And I think one of them is: what does SEO stand for? And we tied this into a competition, so three people could win up to three iTunes vouchers, worth £25 each. And in order to enter, people had to complete the quiz and publish their results on Twitter, which would include a link and the hashtag as well. We had about 80 entrants in the end and I shared it on a couple of competition websites, so we ended up getting a lot of buzz from those kinds of websites. And obviously a few links as well. So that’s all the content we did. I’ll just quickly jump back into the presentation. 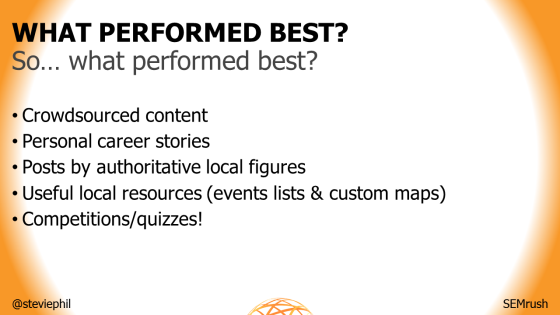 Just very quickly talk you through what performed best. So, most unique visits, it was the quiz. And I think it was because it was pushed out on social media, it was listed on a few competition websites, and it performed very well. The most popular from organic search to date is the co-working space page. It ranks page 1 of Google for “co-working cardiff”, “co-working south wales”. They don’t get huge amounts of search volume, but it’s great that that post is just going to… I’m going to update that on-going – so even though I published it in January, I’m going to update it as-and-when new spaces open. And that’s still performing well to this day. 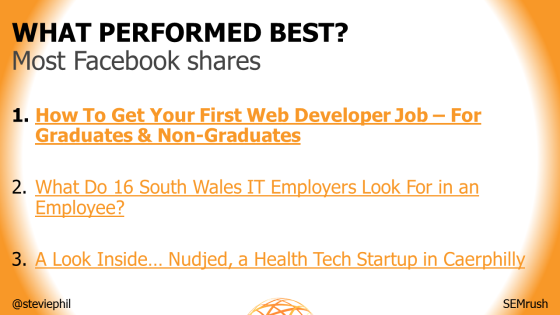 The most links went to the “Why Start a Business in Cardiff?” post – as I said, it got shared on Reddit, which helped with its viralability (if that’s the right word). And the other two posts that did really well were the two crowdsourced posts, mainly because the people involved linked to them from their own websites. The most Twitter shares – whether shared normally or retweeted – was the quiz. Mainly – as I said – in order to enter the quiz, people had to tweet the link, and 80 people entered in the end, so that was about 80 tweets at least – it might have had some more tweets than that as well. The events post got a lot of tweets… as I mentioned earlier, I tweeted each event to let them know that we’d added their event and tweeted every time we updated the post as well, so a lot of that is probably my own handiwork, but I think quite a few people shared it as well because they found it a useful, handy resource. And no surprise, the crowdsourced post got a lot of tweets as well because I tweeted people to let them know that it was live and a lot of them shared it on their own personal and company Twitter profiles. In terms of most Facebook shares though, the standout winner – as I mentioned earlier – was Cheralyn’s post, talking about her own personal story of how she did well and how she’s advanced in the web development industry, despite no qualifications. And it just goes to show that personal stories – if you want to do well on Facebook, in particular, if one of your KPIs is to get so many shares/Likes on Facebook – then really personal content will work with that well. She shared it and her employer shared it and a lot of her friends, family, co-workers shared it as well. And I wouldn’t usually bat an eye to LinkedIn (no offense LinkedIn), but because LinkedIn is treated as sort of the professional and recruitment social network, and we’re a recruitment agency, I shared some of the posts on there and the crowdsourced post did very well, mainly because a lot of the people involved were 1st connections, and actually – similar to how you can on Twitter and Facebook – you can now @mention and tag LinkedIn users. So when I published it from my personal profile I said: “here’s what 16 IT employers look for in an employee including: person A, person B, person C,” and a lot of those people shared it on, because they got a notification as well – it just made it easy for them to share it based on the notification, rather than thinking to do it themselves. So what performed best overall? As I mentioned, crowdsourced content did really well… you end up with an army of people who were willing to share the post because if they were included in the post, they’re going to help share and promote it as well. The personal career story by Cheralyn did really well on Facebook. Posts by authoritative local figures, so – as mentioned – one of our most popular posts was the one talking about why more businesses should start up in Cardiff and in South Wales. 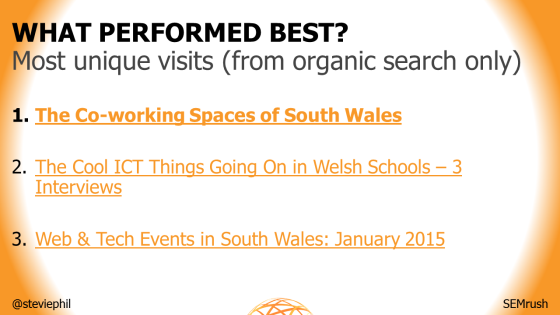 Useful local resources so – again – I’m glad that I had that local focus, so the list of events in South Wales, list of co-working spaces in South Wales, they were really useful to people. And the competition and the quiz – I’m glad we added that in. It felt like a bit of a weak inclusion, it’s a bit of a gimmick, but it ended up being very popular. And it was a good way to end it, I thought. 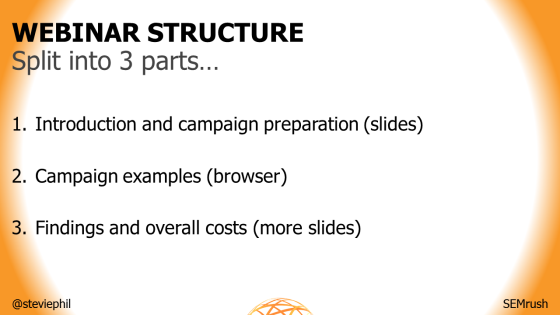 So the total cost of everything… As I said, this was a low-budget campaign. All of this was free. So the hosting was just bolted onto my own hosting. The theme was free – now we had plans to actually buy a paid WordPress theme, but we found one that we liked – that did everything we wanted – for free. Coming Soon Page plugin was free, as were the Google Calendar event embed plugin, the timeline plugin and the quiz plugin – they were all free. All content – except for the posts we asked the copywriter to write – were free. They were all guest blog posts, contributions or crowdsourced contributions, or I wrote them myself. And all images – not including the infographic – were free because we didn’t use stock images, we used Flickr Creative Commons, which I personally prefer anyway because they’re real-life photos. I feel like stock images can sometimes feel a bit sort of ‘forced,’ whereas photos on Flickr… sometimes it can take awhile to find a really good one, but they often feel a lot more authentic. And this is all we paid for. The domain. We paid for three months of Akismet, and then we closed comments. The cake logo – I feel awful saying this – but we bought it from Fiverr. Local designers were charging £200, if not more, and we managed to get it for £13.57, so less than a tenth of the price – we had a very specific brief, we knew what we wanted, gave it to a designer through Fiverr, and we were delighted with the results. The iTunes vouchers. The copywriting posts. We hired someone to help out with the press release and outreach because press releases aren’t my strength. And the infographic as well – I managed to get a good deal on that. That’s a total of £550. For those of you based outside the UK, that’s about – given current exchange rates – $850/€750 for 25 posts and a website. That works out to about £22 per post. And what’s really interesting is if we hadn’t bothered with some of the high-ticket items, like the infographic, it would have cost £14 per post. And if we hadn’t have bothered with the press release either, then the whole campaign would have just been over £200 – worked out to £8 per post. 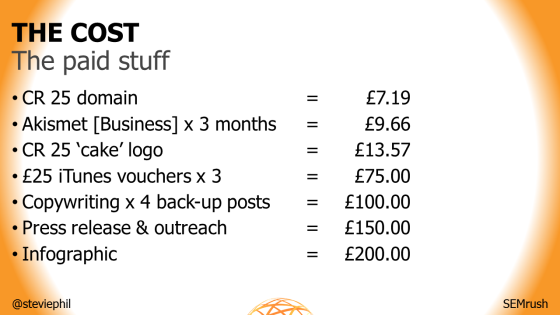 Now, I know some people who pay £50 for a blog post, so imagine that you can create it yourself for £8 pounds each. It just goes to show that content doesn’t have to be expensive. You can create it all yourself – nicely, cheaply, easily – and you don’t have to pay through the roof for interactive content either, so: things like quiz plugins, map embeds, calendar embeds… you can get them for free or for very, very cheap. So you don’t have to think as well that if you want some sort of fancy, interactive content that you have to pay the earth for it, because chances are you can create it yourself for free. And I certainly wouldn’t call myself a developer either. So I didn’t have to create the quiz using HTML – I could just use a plugin that somebody had already done. And that’s me, pretty much done and dusted.